The first picture below is a combination of Artists that have done various backgrounds for ATC. Our group ATC for Beginners were involved in doing a background swap. So we each did a background or several and then made the number of people that signed up and we each got a set. Here is a wonderful book of backgrounds that I have been admiring and even doing since I received my lovely gem. The hostess, Jen from Australia and a new member Tina got the idea and took it from there. It is amazing how far this book has travelled, how many hands worked on it and we all got a set. The book is not together because I wanted to spread it out for you to see. I will be assembling it this weekend. I forgot to mention that most of the backgrounds have instructions on the back to tell us how to do each technique. Thank you for all who participated. We plan on adding to it in the future. Having that said, I took some of the ideas from the book and played around with paper and stamps etc to make this nice little inchie book. 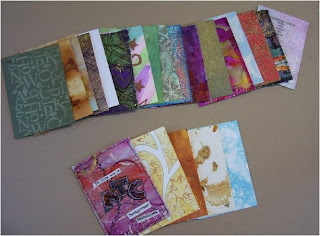 We recently had an inchie booklet swap over at Addicted to Inchies. so I was still in this frame of mind. I like working in small, it is relaxing and it really sparks my creativity. All the pages in this book have been altered in some way, shape or form. I even added another technique not included in the book that Jen had on her blog using masking tape and pastels. I will explain that another time as there is just too much to tell you right now. This is the Front and Back cover. The front has telephone book paper that has been glazed with a mix of acrylic paint to make it look sort of rusty, if you click on each picture you should get a better close up. I then took my glue stick cap off and used it to stamp rusty coloured circles and a marker cap (smaller in diameter) to stamp antique white circles. The back cover is the bubble technique, purple bubbles on a very light purple paper. The crow is peeking out of her frame and I adorned her with a frilly neckline. Isn't she cute?? Next is the tissue paper background and I sprayed a bit of Radiant Rain and gave it a little shimmer with gold.The Asian beatuies are on masking tape with oil pastels sealed then the inchie beauties are glued on and some small butterlies fluttering here and there adorned with stickles for a shimmer. Next is just a plain green paper that I sprayed with gold radiant rain ( love that stuff), punched a border on the end and where the hole is. Added some travel inchies, stamped a Poste Card stamp on some distressed inked paper. The opposite page has painted paper towel, a crow with a crown, and some music he is singing to, perhaps to his girlfriend on the back cover. She is rather pretty with her frilly collar. And this last 2 pages, just an inked green paper with some stamps of numbers, Some versamark ink resist technique using dye inks, love that technique, thanks Gwenny! the clock in the top left corner is coated in Glossy Accents, they should have called it glassy accents, great stuff, gives it a more 3 D effect. The opposite page is a full page of Versamark ink resist using purple and Frayed burlap (distress dye ink) rubbed on glossy photo paper. the stamp is a French script what I used and when you rub the ink on and blend the colours you get a lovely mutation of colours and the print is white from the original paper colour. I can see using this technique for Christmas cards this year. Today I also received my inchie booklet from a swap I was in but stay tuned for that. Thanks for dropping by and if you have any questions just comment or leave me an email. I would be happy to hear from you. oh wow Les, your inchie booklet is amazing, such a great idea to display your inchies. Had a closeup of all your backgrounds and they look luscious. Lovely Les, backgrounds rock. I read every word and looked up close to all also. Yepper, bet that is who Mr. Crow is singing to, shes a cutie with her fancy collar. Must share with Jen, "Yes, lets do it again soon."